Abstract: This wide-ranging, two-hour-long group interview began with the oral history of the Kizh-Gabrieleño band of Mission Indians (self-described) from their settlement of the San Gabriel Valley through the missions and conquests of the Spanish, the arrival of Anglos and the conquest of the area by the United States, the dispossession of an elder female member of their community, Victoria Reed by Benjamin Wilson in the late 19th century (of Mt. Wilson fame – the tribe has gathered extensive documentation of this theft) and up to the present day. 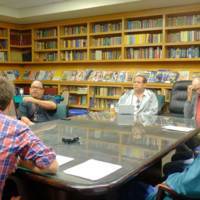 This was primarily related by Andy Salas, the son of Chief Ernie Salas (who describes himself as the “elder spiritual leader” of the community), with some stories related by Chief Ernie and fact-checking and other points of information offered by Tim Miguel, who served as archivist and librarian during this interview (he showed many images and documents that the tribe has collected on his iPad, some of which are available on their website, and which can hopefully be linked/shared in the context of digitally archiving this interview). Among the topics discussed were native place names and culture, Spanish colonization, the 1781 San Gabriel Mission Revolt, Toypurina, intermarriage, agriculture, the development of the San Gabriel Valley, the expropriation of native land, and the current life of the tribe. Tim Miguel also explained that he had been born in Hawaii, and that his native ancestors had been enslaved by the Spanish and then sold/shipped to Anglo planers in Hawaii in the early 19th century, and that enslavement was a fate that awaited indigenous Gabrieleños who refused baptism (he noted that it was “safer to be Mexican than Indian” in those days, both among the Spanish/Mexican rancheros and as Anglo colonists arrived). 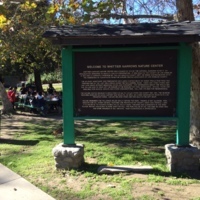 As the interview reached the present, they connected the plan to redevelop the Whittier Narrows Nature Center to the ongoing expropriation and development of native land, referring to the area as “sacred ground.” At this point, Ed Barajas and David Holgut jumped in to offer descriptions of the Nature Center, the endangered species and migratory birds that live in the area, and their desire to defend and preserve it. 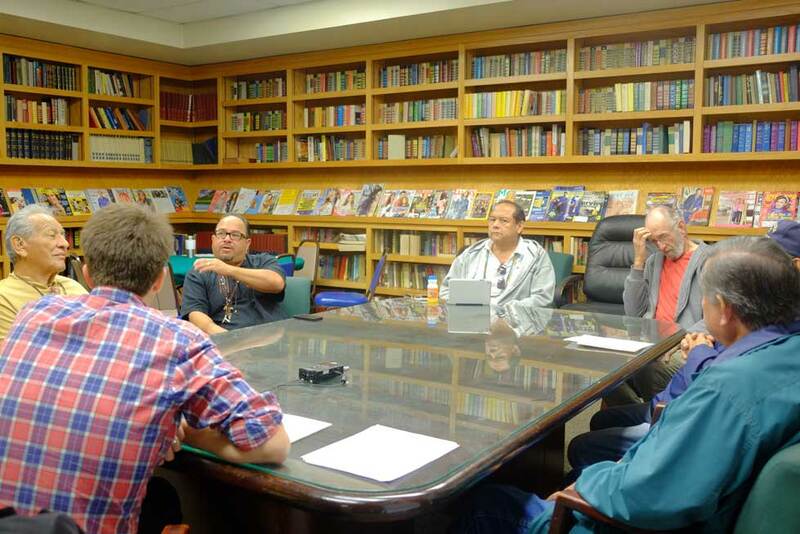 After this initial chronology, we jumped back to the 1930s and 1940s, with Chief Ernie and Ed discussing their youths in the barrios of El Monte and South El Monte, including Canta Rajas and Hicks Camp. The men worked in agriculture and also, briefly, on oil rigs in South El Monte, enjoyed swimming and gathering at Marano Beach on the Rio Hondo, and going out in zoot suits to the clubs and bars of the area, particularly Rancho Don Daniel, which consisted of many venues along Marano Beach and nearby. They described the segregation and discrimination they faced as Mexicans and Mexican-Americans in work, recreation, and education, which prompted a wide-ranging discussion of racism and prejudice in the San Gabriel Valley over the course of the twentieth century, in which all of the interviewees participated, noting improvements but continued challenges. Chief Ernie also told the story of how his family, living in San Gabriel at the time, preserved a Japanese-American business, the San Gabriel Nursery, when its owners were interned during World War II. The business survives, and Tim Miguel showed us a photo of Chief Ernie with the daughter of the interned owners, who still owns the business (and, I believe, may have suffered the ordeal of internment as a child). From here, we returned to the present challenges facing South El Monte and El Monte, with a focus on the rapid rise in property values and the continued presence of a racially differentiated market in land and housing. Nick Juravich, “Interview with Ernie Salas, Andy Salas, Tim Miguel, David Holgut, Gregario Gonzales, Ed Barajas, James Odlin	,” East of East, accessed April 22, 2019, http://semapeastofeast.com/items/show/26.